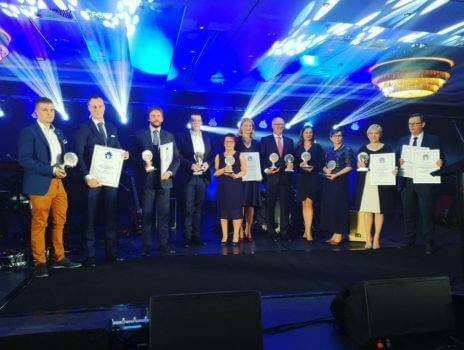 The most socially responsible companies in Poland were decorated at the 20th edition of the “Benefactor of the Year” competition. The Adamed Group Foundation won in the “Corporate Foundation” category, gaining recognition for its vastly successful ADAMED SmartUP programme. On 29th May, awards in the “Benefactor of the Year” competition were presented to all winners. In this year’s edition, the Rzecznicy Nauki [Spokesmen for Science] association nominated the Adamed Group Foundation by enrolling it in the “Corporate Foundation” category. The jury recognised the Foundation’s achievements, awarding it with the “Benefactor of the Year 2017” title. The Academy for the Development of Philanthropy in Poland has been the competition’s organiser for the past 20 years, supporting local communities and appreciating socially involved companies that act for the benefit of others. The organisation awards those which, in their business activity, take into consideration their surroundings and dedicate their own time and resources to making the world a better place. The “Benefactor of the Year” title comes as a great honour and a source of pride for the Adamed Group Foundation. Special emphasis among CSR activities at our company is placed on education, which has a unique impact on creating an innovative society and which will bring about another generation of outstanding scientists in the future — said Katarzyna Dubno, Director of External Relations and Health Economics, Member of the Management Board of the Adamed Group Foundation. The ADAMED SmartUP programme, which has been organised by the Adamed Group Foundation for the past three years, certainly contributed to the award. So far, nearly 16 thousand people have enrolled to participate in it. This unique nationwide scientific and educational programme is aimed at exceptionally talented students of secondary schools, offering the participants direct support in developing their scientific passions. For information about the competition, go to www.dobroczyncaroku.pl.